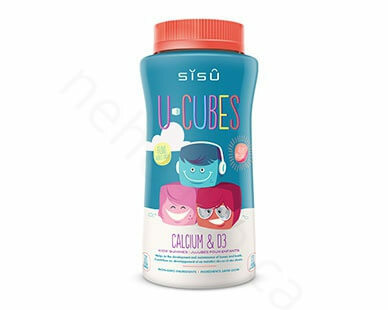 SISU U-Cubes™ Calcium and D3 gummies are specially crafted for children as daily calcium and vitamin D supplement and a sweet-tasting treat. Unlike other gummies, they are pectin based, made with all-natural flavours, sweeteners, and colours, and contain no animal gelatin or high-fructose corn syrup. Kids will love the great taste and texture and you can love that you are providing them with essential nutrients for growing bodies and minds and helping them to reach their full potential. Calcium is the most abundant mineral in the body and 99% of it is stored in the bones and teeth. Adequate calcium intake is important at any age, but it is crucial during childhood, a period of rapid physical growth and development that depends on good nutrition. Vitamin D promotes calcium absorption and enables its retention in the bones and it is also needed for bone growth. Sometimes, despite our best attempts, children’s diets can experience nutritional gaps. Supplementing with a high-quality calcium and vitamin D formula is a safe and convenient way to fill in daily dietary shortfalls and will help provide your kids with the essential building blocks for strong bones and teeth. 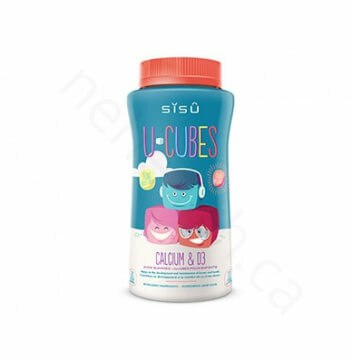 SISU U-Cubes™ Calcium and D3 gummies are specially crafted for children as daily supplement which are pectin based and made with non-GMO ingredients. tapioca syrup, evaporated cane juice, pectin, citric acid, black carrot juice, natural blueberry flavour, vanilla extract, natural pink lemonade flavour, natural strawberry flavour.